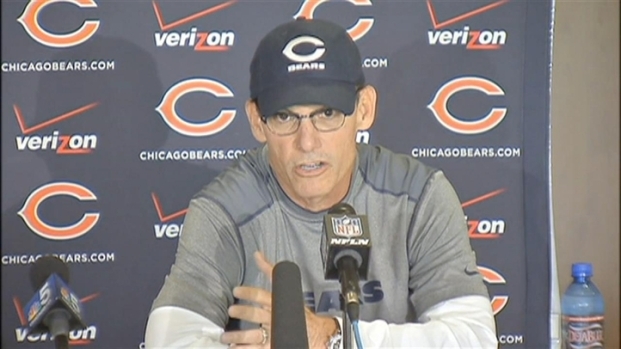 Marc Trestman brought changes to the Chicago Bears training camp. Nine morning practices replace the noon starts under Lovie Smith. Players are also encouraged to use open seating in the dining hall to "shake someone new's hand." According to Trestman, it's all about team building and accountability. The first physical step of accountability came Thursday as players were tested on conditioning by running three sets of three hundred-yard shuttles, timed by position. "Guys are going to be nervous," Trestman admitted, but said it's all about buying into being your best if everyone else does the same. "I think it's going to be the hardest test in the NFL," defensive tackle Stephen Paea said. Newly signed safety and Chicago native Tommy Zbikowski said he's fulfilling a dream to play for his hometown Bears, but isn't a fan of the conditioning test. "I can fight (box) or play football all day long... but I don't like conditioning tests," he laughed. Upon reporting to camp on Wednesday night, Bears quarterback Jay Cutler said "not everyone's buying in, but that's OK". Defensive end Shea McClellin agrees, saying Trestman's approach is more college-like. "It might be harder for some of the old players who've been around so long," he said. "The way I look at it, he's more like a college coach, which isn't a bad thing. I like that." For some players, the jury is out if the team building adds up to this team winning.